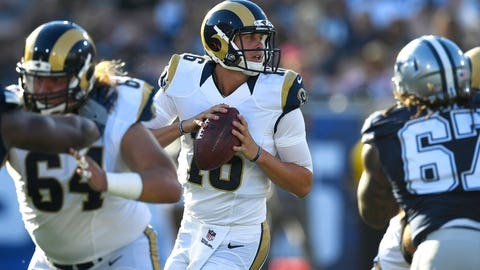 Jared Goff, the first overall pick in the draft, got his first taste of NFL action on Saturday night when he stepped in for Case Keenum against the Dallas Cowboys. The rookie promptly felt his “Welcome to the NFL” moment when he was blasted by a Cowboys defender, resulting in an interception on his second pass, but he looked poised thereafter. Because Keenum started the game, Goff was left to play mostly with the second-team offense. That probably won’t happen again on Saturday when the Rams take on the Chiefs, though. “I’d like to get Jared some snaps with the ones at some point, and it quite likely would be this week against Kansas City,” head coach Jeff Fisher said, via ESPN. Goff should see his numbers improve with the first-team offense, especially having some game experience under his belt now. In the opener, he completed just 4-of-9 passes for 38 yards, which doesn’t include a beautifully thrown ball that was dropped by Pharoh Cooper over the middle. Goff is still behind Keenum on the depth chart, but it’s not out of the question that he’ll surpass him with a few solid performances in the preseason. 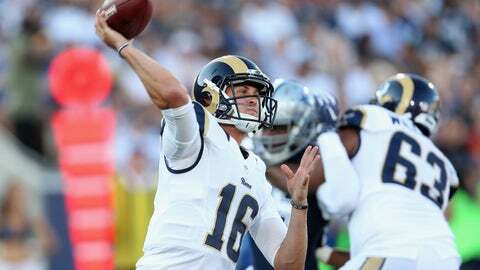 Goff is the more talented quarterback, he just needs time to develop.